The Office of Institutional Compliance (OIC) is charged with maintaining a compliance program that is in alignment with the Federal Sentencing Guidelines’ elements of an effective compliance program. An important component of this criteria is monitoring the effectiveness of an organization's compliance efforts. The Chief Compliance Officer implemented Compliance Risk Reviews in the summer of 2017 as a way for the OIC to meet this criteria. This approach to monitoring provides an in depth look at priority risk areas and fostering a culture of continuous compliance improvement. 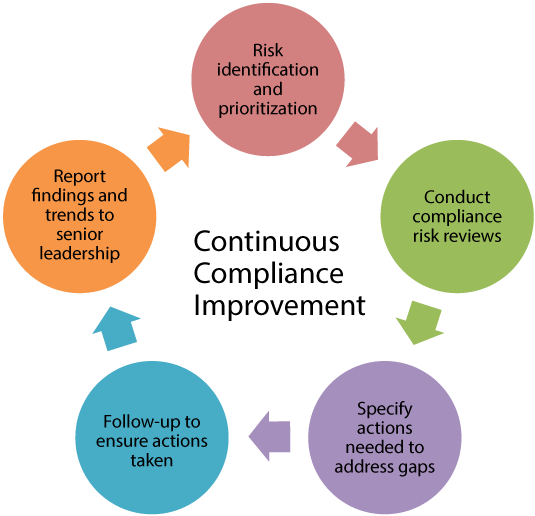 Compliance Risk Reviews (CRR) are a proactive process of collaborative, cross-disciplinary, cross-educational gap analysis and mitigation of the Institution’s compliance efforts. The scope of the CRR varies from a focused look at compliance efforts related to one regulation or policy (e.g. HIPAA) to a broad view across a class of regulations or policies (e.g. privacy regulations). Compliance risk reviews align with two elements of effective compliance programs, per the Federal Sentencing Guidelines. Identifying risk areas to schedule for review is a collaborative process. Information is gathered from outside resources, such as the Society of Corporate Compliance and Ethics, the B1G Compliance Officer Network, and the Minnesota Compliance Officer Network. Incidents occurring in the compliance arena both locally and nationally are considered. Key regulatory changes and internal compliance and risk management conversations with the University’s compliance partner network, Executive Oversight Compliance Committee, and the Audit and Compliance Committee of the Board of Regents also influence which risk areas are on a regular schedule for review. As of 1/1/18, there are 34 risk areas that are planned for review in a 5 year cycle. Other risk areas are identified as reviews to be conducted “as needed”. This list can change depending on a number of factors.